The following lecture is devoted to the discussion of Cardiac Septation. 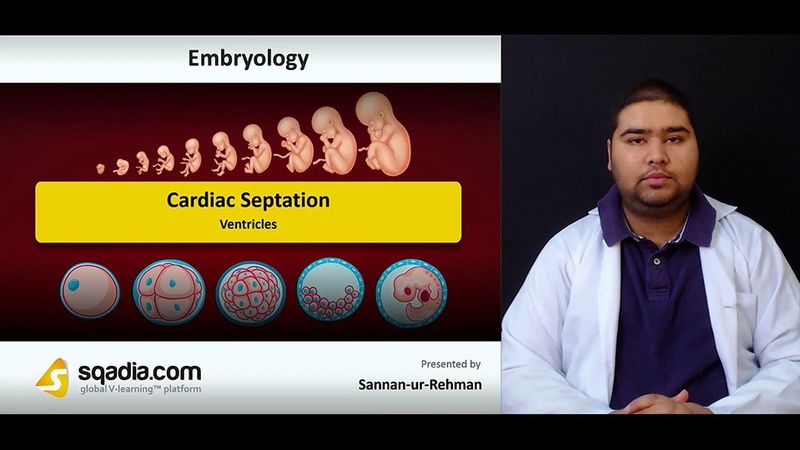 Section one of this lecture is about the Methods of Cardiac Septation. Firstly, the educator puts forth an overview of Methods of Septation. Afterwards, the Endocardial Cushions are demonstrated in detail. Later, light is shed on what situation arises Without Endocardial Cushion. Section two focuses on the Cardiac Septation From Atrium to Atria. The educator comprehensively talks about Septation of Common Atrium and brings under consideration Foramen Ovale. In addition to this, light is shed on the process of Reversal of Blood Flow after which Probe Patency is discussed. Apart from this, the educator speaks extensively about Left Atrium and Pulmonary Vein. The prime focus of section three is the elucidation of Atrioventricular Canals. The educator elaborately explains Bulboventricular Flange, Endocardial Cushions, and Atrioventricular Valves. Moreover, the Clinical Correlates of Atrioventricular Canals are highlighted. These include Holt Oram Syndrome, Hypertrophic Cardiomyopathy, Ventricular Inversion, Hypoplastic Right/Left Heart Syndrome, Hypoplastic Right Heart Syndrome, Atrial Septal Defects, Cor Triloculare Biventriculare, Premature Closure of Oval Foramen, Endocardial Cushion Defects, Ostium Primum Defect, and Tricuspid Atresia Ebstein Anomaly. Section four accommodates the elucidation of Outflow Tracts. First of all, the Truncus Arteriosus is comprehensively reported. The educator then moves towards the explanation of Conus Cordis and speaks elaborately about Cardiac Neural Crest Cells. Afterwards, light is shed on Tetralogy of Fallot and Persistent Truncus Arteriosus. At the end of this section, Transposition of Great Vessels is discussed in detail. In section five, the educator deals with the elucidation of Ventricles. The process of Septation in the Ventricles is extensively demonstrated. In addition to this, light is shed on Semilunar Valves. Moving forward, various Ventricular Septal Defects are highlighted by the educator. These defects include DiGeorge Sequence, Valvular Stenosis, and Ectopia Cordis.